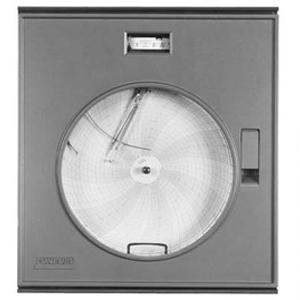 These instruments are used wherever precise chart records, indication, or control of pressure measurement is required.They record on a circular chart, or indicate on a sector scale or concentric scale. The recorders and sector scale indicators are available with up to four pens and two pointers, respectively. The concentric scale indicator is available with one pointer. The controllers control one or two measurements while the control elements transmit a standard pneumatic signal to a final operator that may be as far as one hundred metres (three hundred feet) distant. Metal diaphragm bellows or spiral or helical bourdon tube measuring elements are available for operation from full vacuum up to 200 MPa (30 000 psi, or 2000 bar or kg/cm2). Spans may be as narrow as 2 kPa (0.3 psi, or 0.02 bar or kg/cm2). Elevated-zero (compound) or suppressed-zero ranges are also available. These elements can be selected from a variety of materials to suit many process requirements. These instruments may be mounted in a panel, on a surface, or on a vertical pipe. The controllers are available with On-Off, Proportional, Proportional plus Derivative, Proportional plus Integral (Reset) (STABILOG), and Proportional plus Integral plus Derivative (HYPERRESET) control functions. A glass fiber reinforced case and gasketed door with a shatterproof glass window meet IEC IP53 and provide the environmental protection of NEMA Type 3.